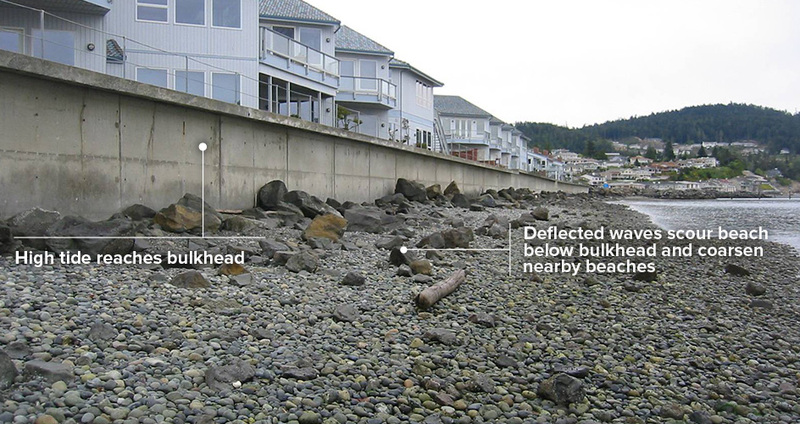 Bulkheads and other hard armor are found along 25% of Puget Sound shorelines. Among residential properties, nearly 50% have at least some armoring. Some areas are more modified than others. 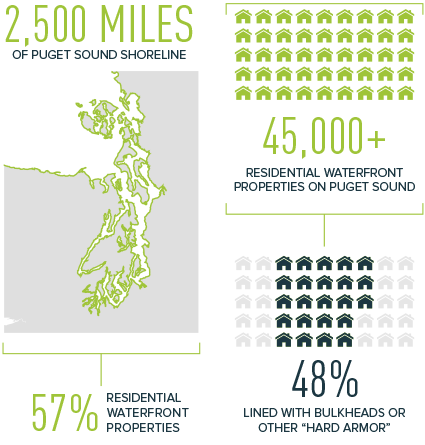 Bainbridge Island, which has a mix of open and sheltered shorelines, is more than 50% armored. The rocky shores of the San Juan Islands are mostly unaltered. Most of the waterfront from Everett to Tacoma is a ribbon of concrete because the railroad tracks were built along the water. Some bulkheads can last as long as 50 years, but others crack or tilt much sooner due to pressure and slides from the slope behind them and the impact of waves and drift logs. The beach in front of a bulkhead is also continually scoured by deflected waves, which can expose the base of the bulkhead and lead it to sink or fail. All of these challenges will likely be worsened by rising sea levels due to climate change. Many properties that currently have a bulkhead could be well managed with soft shore protection techniques. Bulkheads, seawalls, revetments, and other types of “hard armor” are used to protect the shoreline from wave action or to hold back material that is eroding from the upper shore or a bluff. On some waterfront properties, they are primarily a landscaping feature—to allow a lawn to extend to the water’s edge, for example. However, they can be unsightly and make it harder to access the beach. Bulkheads are now considered the option of last resort and are most often built to replace existing structures that are failing. If your home sits right over a beach, for example, replacing the bulkhead with a more natural shoreline might not be feasible. 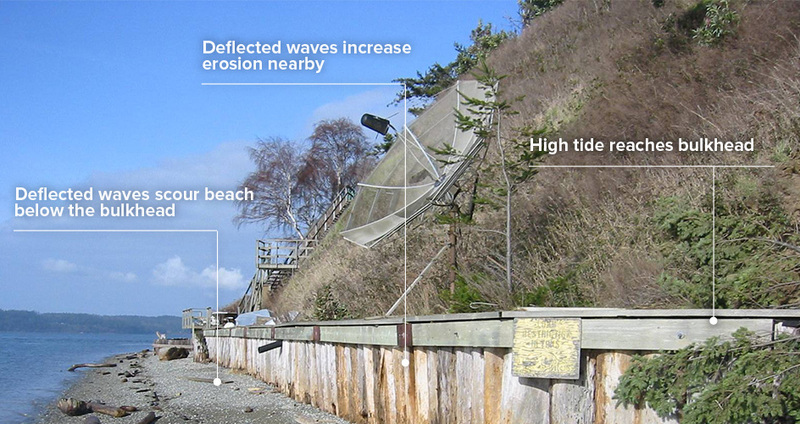 These structures can reduce erosion on a given site but can coarsen the beach. They can also cut off the natural supply of sand and sediment and make erosion worse on adjacent beaches. Over the long term, this degrades shoreline habitat for salmon, seabirds, and other fish and wildlife. Concrete bulkheads are expensive to install because they are usually poured on site and require permits, design and engineering plans, and heavy equipment for excavation and to install the concrete forms. The cost runs into the tens of thousands of dollars. Wooden bulkheads are less expensive to build but don’t last as long as concrete structures. 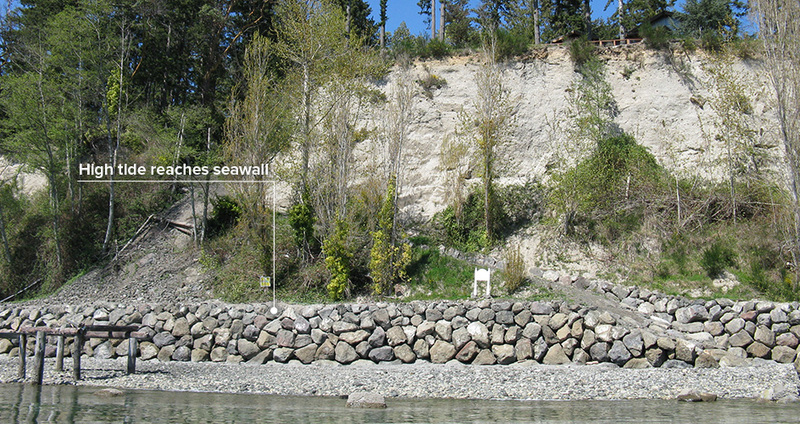 Rock revetments and rock seawalls are also cheaper, but they allow fine sediment to be sucked out through the rocks, which can affect the structure’s stability and create the need for repairs or reinforcement. Some Puget Sound counties offer grants and tax breaks for removing your bulkhead and restoring the waterfront to a more natural state.